I use Plaxo, its a way to sync my Microsoft Outlook stuff with a website so that I can get at this stuff when I am not in my office. Well when my hard disk on my laptop at work bit the dust a month or so ago, I never got around to putting Plaxo back on. Really I completely forgot that I needed to reinstall the software. Anyway, so today I was sent an e-mail for a new contact who also uses plaxo, and I thought it was funny that it did not get added directly to my contacts list. Then I remembred that I never did reinstall it. So I took care of that, and when you install the program or when you get a new contact that also uses Plaxo, they send you this Plaxo Alert. 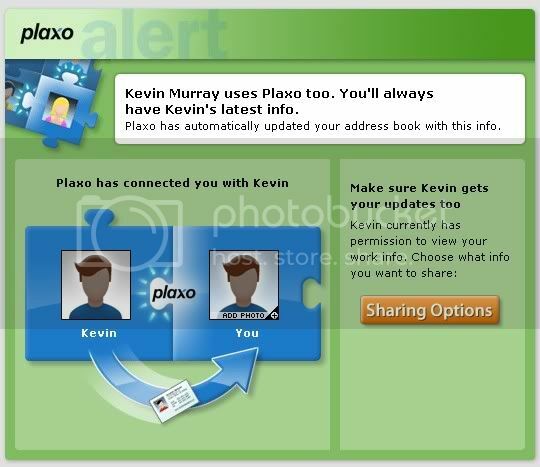 Well I got a Plaxo alert that I use plaxo and I found it really funny. But you know, with the way my memory works, it just might be true. LOL.